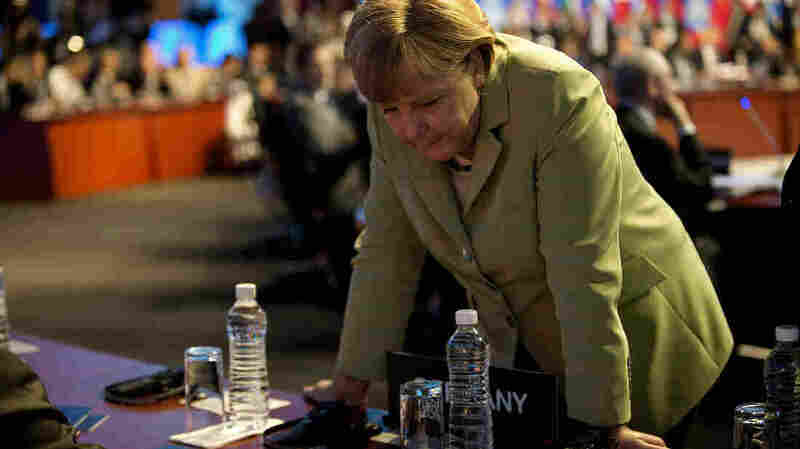 Germany Resists Concessions To Greek Bailout Terms At the G-20 summit in Mexico, German Chancellor Angela Merkel reiterated her tough line that bailout terms for Greece are not negotiable. Since accepting the tough conditions of the bailout, there's been talk that Greece's new ruling party wants to seek some concessions on the terms of the rescue package. German Chancellor Angela Merkel speaks with members of her delegation before the first plenary session of the G-20 Leaders' Summit in Los Cabos, Mexico, on Monday. Binde Balle, a 71-year-old retired doctor from northern Germany, is typical of many in Germany who see Greek elections as only a minor victory in the effort to keep the eurozone from breaking apart. She says that the Greek problem is far from solved. "The work is only just beginning," Balle says. "Now, Greece has to move: Taxes need to be collected, people need to get back to work, and there must be investment. This simply can't go on any longer. They've made the first step, but the problem is still very much there." The G-20 report Tuesday included a pledge to consider concrete steps toward "a more integrated financial architecture" in Europe that would include common banking supervision. There are other proposals out there to slowly create a kind of fiscal United States of Europe. Balle is behind that idea and voices her support with a sense of urgency that her chancellor is often criticized for lacking. "I do not think there is a widespread willingness among Germans to give up sovereignty to Brussels," she says. "But if we want to keep the euro, then we have no choice other than to pursue economic and financial policies together as Europe. It's an urgent matter, and Germany will simply have to give up some of its sovereignty." Other European countries might also need to give up some sovereignty to Brussels, the capital of the European Union, though it seems Europe is still far away from convincing leaders to relinquish more control. Talk of a tighter fiscal union will be part of a mini gathering of EU leaders in Rome on Friday, and a meeting of all the EU heads of state in Brussels next week. But economic integration involves complex issues, lengthy negotiations and perhaps treaty changes. Former International Monetary Fund chief economist Ken Rogoff, who's now at Harvard, says it is vital that the upcoming gatherings show that leaders are making discernible progress and not just talking. "I think they need to take a quantum leap over the next month or two towards unification if this isn't to blow up," Rogoff says. "They have to agree that they are going to take radical steps over the next 15 years." Rogoff says they need to start with something like a banking union, euro bond or some other nascent fiscal union that gets things moving in the right direction. German officials, however, are still resisting calls for shared euro bonds. They want incremental fiscal integration, but fixing those deep, structural problems that have hampered a solution to the debt crisis for nearly three years will take time and political will. Matthias Matthijs, who teaches International Economic Relations at American University in Washington, says that's something Europe might not have. "The low hanging fruit of integration is gone. Now we have to talk about redistribution, about guaranteeing each other's pensions [and] things like this," Matthijs says. "So then you have to have a political commitment to euro bonds down the line, to a real fiscal union. And are we politically ready for this in Europe? I just don't see it." For Americans, the debt crisis in Europe may seem distant. But part of what's at stake is the extremely fragile U.S. economic recovery, says Jean Pisani-Ferry, director of the Brussels-based think tank Bruegel. "What we've learned in 2008 [is] that the interdependence was much stronger than people believed earlier," Pisani-Ferry says. "We saw immediately the U.S. shock transmitted to Europe. The U.S. and European financial markets are so strongly integrated that the impacts are extremely strong."